There's no doubt that the bold red, yellow, and orange hues of the setting sun make a dramatic display. The sun may rise and set every day, but the sight still strikes us as miraculous. Use YourDictionary's collection of sunset quotes to pay tribute to nature's beauty. It was the cooling hour, just when the rounded Red sun sinks down behind the azure hill, Which then seems as if the whole earth is bounded, Circling all nature, hush'd, and dim, and still, With the far mountain-crescent half surrounded On one side, and the deep sea calm and chill Upon the other, and the rosy sky With one star sparkling through it like an eye.  Lord Byron, Don Juan (1818-24), Canto II, Stanza 183.  Henry Wadsworth Longfellow, Evangeline: A Tale of Acadie (1847), Part I, Section IV. Forming and breaking in the sky, I fancy all shapes are there; Temple, mountain, monument, spire; Ships rigged out with sails of fire, And blown by the evening air.  J. K. Hoyt, A Summer Sunset.  Samuel Rogers, The Pleasures of Memory, Part I, line 94.  Robert Service, The Land God Forgot.  William Shakespeare, Richard III (c. 1591), Act II, scene 3, line 34. The wonder of a sunset lies in the fact that no two are exactly alike. Each one has its own unique appeal and the longer you wait, the more wonderful it seems. It's much like seeing a work of art outside your window each evening. "In early June the world of leaf and blade and flowers explodes, and every sunset is different," John Steinbeck wrote in The Winter of Our Discontent. The beauty of a sunset often makes us think of those we love, as well as the intense rush of emotion that comes from falling in love with someone special. The colors of a sunset can't help but evoke feelings of passion, especially since this metaphor is used in literature and music throughout history. 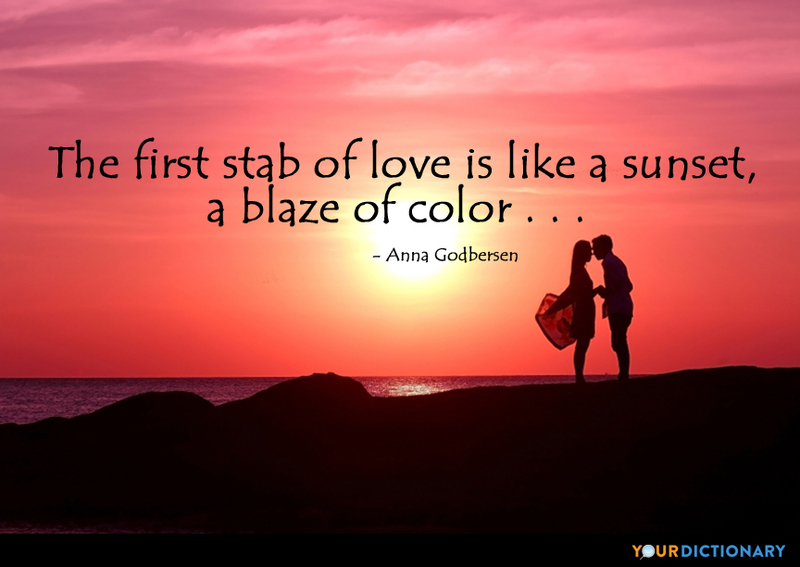 "The first stab of love is like a sunset, a blaze of color," contemporary American author Anna Godbersen said. Sunsets mark the end of the day, but we can take comfort in knowing that new beginnings are just around the corner. In the noted poem, The Hanging of the Crane, Henry Wadsworth Longfellow wrote, "After a day of cloud and wind and rain Sometimes the setting sun breaks out again, And, touching all the darksome woods with light, Smiles on the fields until they laugh and sing, Then like a ruby from the horizon's ring, Drops down into the night."